It looks like you can still order the Operation Bear Trap set. I just received mine in the mail last week. Convention schedule has been released. For everyone other than Golden Ticket holders, package pickup begins Thursday at 6:00 p.m. Attendees will receive an email with their pickup time based on order of registration. I believe this is the first confirmation of a parachute drop for this year, too. Maybe a Night Force Crazylegs? Not for sure- but I believe they still had a minimum they had to run before a manufacturer would even turn on the machines or keep the same price point for the club-- so I think once they crossed a threshold for preorders they moved forward- figuring they could sell any overage. Pretty much. They fell short of the MOQ by 100 or so. Turns out there was more complaining than actual demand. Why do I picture- figures dropping from the sky-- and people punching each other on the ground. If the dealers are the only reason you're going, I guess. That aspect of the convention is pretty low on the list of reasons I like to go. The way they do it now is clear out an area for kids to catch the figures. If any travel beyond that area, the adults are free to catch and keep them, but the figure will be for sale in the Club store after the drop. Personally, I just like to stand back, watch, and then buy the figure. I stopped at a Walgreens last night, and actually found the POC Cobra Commander from the wave 5 series that was never in my area...crazy. So if anyone somehow still sees a Jungle Bat or Crazy Legs in the wild, please let me know! Thanks! Crazylegs wasn't in the assortment that Walgreens was getting recently, but the Jungle B.A.T. was. My local Walgreens stores have moved on to Retaliation figures, but people in other areas are still reporting Pursuit of Cobra finds here and there. It's worth stopping to check other Walgreens locations in your area if you find yourself near one. I've also seen reports of the same PoC figures being found at Rite Aid stores, but all the ones around me still have The Rise of Cobra figures for $12.99 or so. I believe this is the first confirmation of a parachute drop for this year, too. Maybe a Night Force Crazylegs? I hate how terrible the distribution was for POC after Wave 2. A few figures I never found, a few I only found once. I don't really have much interest in getting a moneybags Destro for $40 or whatever the Ebay price is. TRU put out some more POC a few months ago, but it was just more Wave 1 and 2 stuff. I don't know why Hasbro had to make so much of that and so little of the rest - those were some great figures. I know everyone knew Grunt was going to be a waste of a figure- but it is confirmed-- total waste of a figure-- might as well be an Action Force figure from Wal Mart.. I know this thread has been dead for awhile now but I wanted to post my find. I was out hunting for Retaliation joes and Joe Kreos a few weeks ago, and I met a guy who for some reason has a surplus of Joes in his house. I bought these off of him. The Low Light was half the cost of ebay prices. So the Low-light comment made me go to ebay to see what he is going for. HOLY COW! I found 10+ of those at a discount store near me a few Christmases ago and shipped them out to a bunch of people on here for cost. I should have sat on them and sold them now to make a house payment. So, an ebay search led me to see a Slaughter's Marauders Low-Light for $8.99, buy it now. That surprised me, because i thought those 7 packs were expensive and never picked them up when they came out. I have even contemplated getting rid of the Zarana I had, since I was never going to pay the high price for the Dreadnok 7 pack. 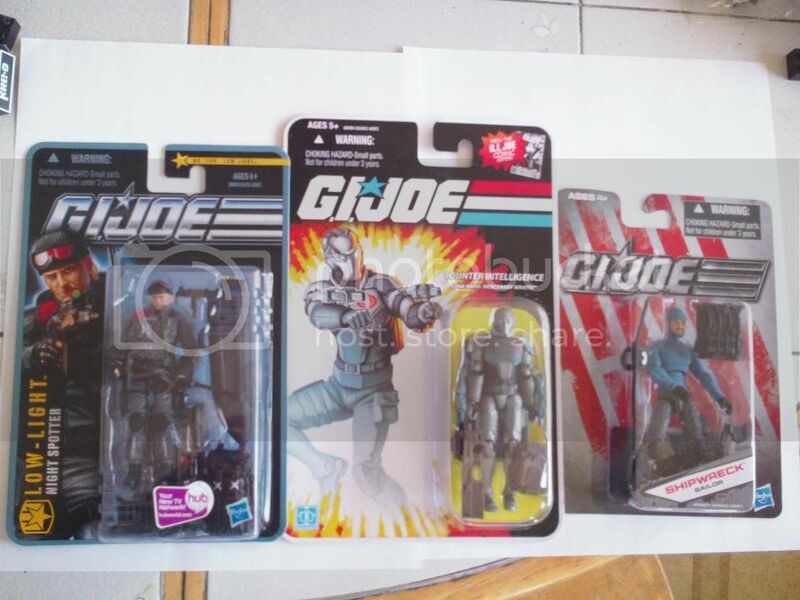 So i called a friend who collects Joes, because I couldn't even remember where that 7-pack came from and he said their price had dropped recently to around ~$100.00 for both 3 packs on BBTS. When I went and looked, the bundle of the 7-packs was on sale for $74.99 (http://www.bigbadtoystore.com/bbts/prod ... ode=retail). I didn't realize they had dropped that much, so I ended up ordering a set. Maybe you guys already knew, but if not, I figured I'd give you a heads up.